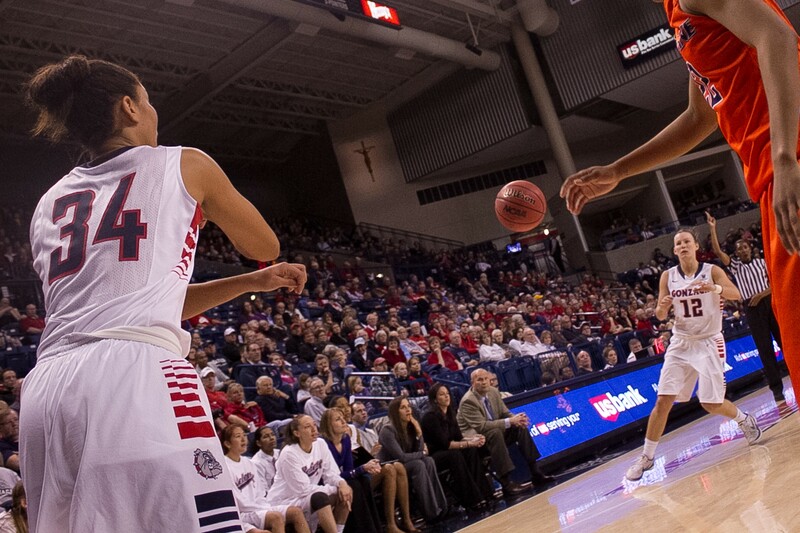 Gonzaga women's basketball has made a name for themselves independent of the men's success. On Monday the Herak Club in Gonzaga University’s McCarthey Athletic Center was a swirl of activity. Athletes sat in rows in front of a projector. Coaches and trainers hovered in the background. It was Selection Monday for NCAA women’s basketball. Gonzaga, the winner of the WCC conference, didn’t have to worry about being invited to the Big Dance. Instead, they were waiting to see what seed they would get and who they would play. Just a day before, the Gonzaga men’s team had made school history by getting a No. 1 seed. However, the women’s program wasn’t and isn’t focused on the men’s success. They have their own future to worry about. "We don't look like we’re in anybody’s shadow. We do our own thing. We stay relevant in our own way and hopefully our kids never feel like they are in their shadow," says head coach Kelly Graves. "The reality is that over the last three years we've actually been the more successful program if you look in terms of postseason success, regular season wins, etc." It’s undeniable that the women’s team has made waves. Since their first NCAA tournament appearance in 2007, they’ve gone to the Big Dance five of the last six years. They’ve dominated the WCC conference, winning nine straight regular season titles. They’ve made it to the Sweet Sixteen three times and the Elite Eight twice. Still, in terms of media attention the men are clearly favored. Players recognize this — however, they say they feel supported by Gonzaga and Spokane nonetheless. "I mean its women's and men's basketball, so men are always going to get more, and it's well deserved this year. They're No. 1 in the nation,” says WCC player of the year Taelor Karr. “But I think GU does a good job of really spreading it out and having success in both men and women’s." While maybe not as high-profile nationally, Kelly says the women have their own fans and feel supported by the community. "We're selling out,” he says. “We draw 300 fans fewer per game than our guys do." That kind of pull is uncommon in women’s basketball. In fact, it’s so uncommon that the NCAA has taken notice. Because of GU’s ability to sell-out arenas, the tournament was hosted in Spokane two years ago, and will be this year as well. This gives Gonzaga a distinct home-court advantage, an advantage that they plan on exploiting. Gonzaga plays against fifth-seeded Iowa State University on Saturday at 3 pm. The Cyclones are ranked No. 23 nationally. The mismatch doesn’t daunt Gonzaga, a No. 12 seed. Graves says that they are used to playing as underdogs and look forward to the challenge. This is a focused team. They know what is possible; they’ve done it before. As if to illustrate this point, Palmer, considered one of the team’s leaders, said she doesn’t resent the men’s team. In fact, she seemingly doesn’t pay much attention to the men’s team at all. “So we know that we have the support, so that's not an issue. And we're really happy for the men’s team, especially being a No. 1 seed,” she says. “I know that's the first time, one of the first times, actually, I'm not sure." That kind of focus bodes well for Gonzaga basketball, men or women.